Chocolate Fantasies: chocoholism, chocolate feasts, chocolate love, chocolate parties, chocolate promotions, and chocolate psychology. At the end of the book is a 200-item Chocoquiz, in the style of Trivial Pursuit, so that readers can use the book as a reference source to know everything there is to know about chocolate. Reference sections include acknowledgments to chocolate manufacturers, chocolate-related companies, a listing of chocolate publications (media articles, children's books, chocolate guides, cookbooks, chocolate humor, and chocolate specialities), and an impressive list of addresses and telephone numbers for more than 100 chocolate and chocolate-related companies. 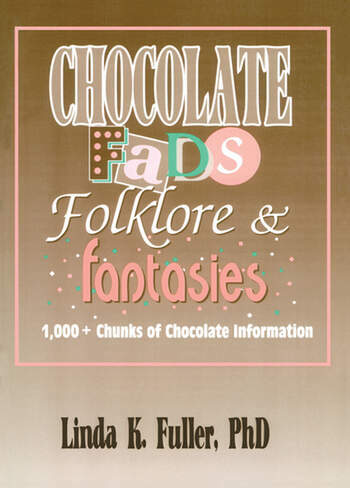 All chocoholics, out of the closet or not, will want to read this book. Chocolate Fads, Folklore & Fantasies promises to be the last word in chocolate, no fudging!